Longfellows offers classic American fare in an inviting ambiance at our signature restaurant, which is open for dinner. Set within a lovingly repurposed 1915 dairy farm, Longfellows Restaurant is brimming with charm; it features four separate dining rooms, each with its own unique personality. Flavorful menu offerings include perfectly prepared cuts of meat, fresh pasta and our justly famous Bourbon Salmon, a perennial favorite; seasonal ingredients are sourced from here in the Saratoga Springs area whenever possible. We’re sensitive to the needs of our diners, and are happy to provide gluten-free and vegetarian menus; please don’t hesitate to tell us about your food allergies, and we’ll do our very best to accommodate your needs. Pair your meal with a glass of wine from our extensive list – or enjoy a cocktail from our full-service bar, which is always well-stocked, whether you are joining us for happy hour or a late-night snack. Prefer to eat in the privacy of your accommodations? We offer room service daily from 11:00 a.m. to 10:00 p.m.
Planning a special event in Saratoga Springs? 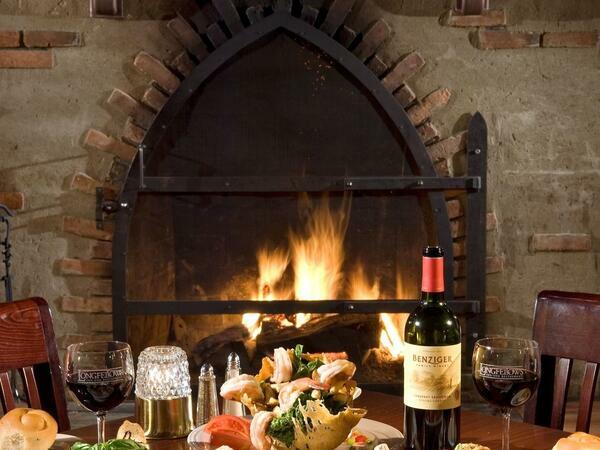 Longfellows Restaurant is a terrific setting for birthdays, anniversaries and other special occasions. Monday - Thursday: 5p.m. – 10:00 p.m., tavern open until 11:00 p.m.
Friday - Saturday: 4:00 p.m. – 11:00 p.m., tavern open until 12:00 a.m. Happy Hour: Monday - Friday 4:00 p.m. – 6:00 p.m., Sunday 4:00 p.m. – 9:00 p.m.
Want us to save a seat for you? Call ahead at (518) 587-0108 for reservations or book your table online through Open Table.